Preheat oven to 325. Grease 9×13 pan with coconut oil and set aside. 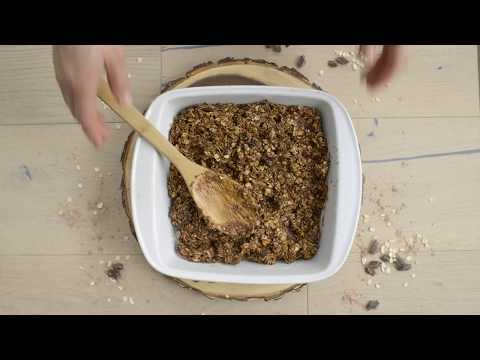 In a large mixing bowl, combine almond butter, maple syrup, protein powder, and Kodiak Cakes mix. Mix until incorporated. Beat in the eggs. Add apple sauce and mix until combined. Add the rest of the ingredients and mix until evenly dispersed. Pour dough into pan and press with your hands or the back of a wooden spoon until it’s evenly distributed throughout the pan. If desired, press some extra shredded coconut on top. Bake for 15-18 minutes, or until dough is set and cooked through. Allow to cool for 5-10 minutes before cutting into 20 squares. Wrap squares individually in plastic wrap and store in the fridge for an easy grab-and-go snack.